Hi, I'm Gail, and I own a bridal shop in Bethel, Connecticut since 1987, and I would like to share my experiences and knowledge with you. You want your photographer to be on the cutting edge and know the latest techniques, but you also don’t want your photos to be so trendy that when you look at your shots in 20 years, all you see is something that instantly dates your wedding. Here are shots that are totally now — but will still look current when your kids get married! Some savvy grooms are hiring photographers to document their proposal so that wonderful-but-fleeting moment can be relived later by the couple and shared with friends and family. Photographer Danny Weiss says this trend is growing quickly, and he loves being a part of it. “I’ll never forget one proposal I shot in Central Park in New York City, in the dead of winter. It felt like it was just me and the couple in the park, and I got really great images,” he says. Creating a wedding hashtag for guests to use to upload photos to Instagram and Twitter can help you experience your wedding through their eyes. Apps, like Artifact Uprising, are also allowing smartphone users to then upload those photos from Instagram and create actual printed hardcover books (not to mention calendars and postcards) of their instant artworks. “I even use their products as little preview books for clients,” says photographer Corbin Gurkin of Corbin Gurkin Photography. Some creative photographers are taking photos of the wedding party separately and then creating playful graphic grid designs in photo albums later. “It’s great because those closest to you put a lot of time and money into being a part of the wedding, and it’s a nice gesture to provide them with a gift portrait after the festivities are over,” says photographer Mel Barlow of Mel & Co. This form of photography takes still photos and animates them, generally in a video set to your choice of music. “I’ve done a series like this for a quick set of 10 to 20 images and put them all together on a wedding album page, and the result was pretty cool!” says Caroline Winata of Milou & Olin Photography. Stop motion works especially well for a short trailer to put on your Facebook page or to send around in an email to close friends. Brides are scheduling bridal portrait sessions in their dresses before the wedding day or allotting time on the day of to take formal portraits of themselves. “You’re spending all this time and effort on your look and it’s nice to document it properly,” says photographer Denise Chastain of Denise Chastain Photography. Another twist? Formal couple portraits, which show posed, traditionally styled shots of the couple. Like backlit photos, film images are super-romantic and are making a mega-comeback in the cyclical world of wedding photography. “I think film is a perfect fit for both décor and portraits,” Gurkin says. But don’t feel like you have to limit your shooter solely to film. “I still prefer the versatility of digital in low light or on a rainy wedding day,” Gurkin adds. The first-look photo has been popular for a while now (see: “Should you do a first look?”) and is still going strong. But some brides are having photographers capture their dad’s first glimpse of them in white as well. “This trend has deep Southern roots and is definitely a sweet moment during the day. Wedding days can be so busy, and I love that some girls choose to take a few minutes to spend time with their dads,” says Genya Garrett of Vue Photography. In addition to better props (think: vintage finds rather than dollar-store pickups), photo booths are going high-tech, with touch screens and Wi-Fi, allowing guests to immediately upload photos to social media, says Matthew Lee of Cly Creation. Why wait until tomorrow to upload photo-booth snaps when it can be done instantly? Using natural light coming in from behind a couple creates über-romantic images. “To achieve this look, you shoot when the sun is setting or rising — when the light is soft and warm, which flatters the subject. “It’s all about the ambience,” says Lee. “When you take a stroll early in the morning or at sunset time, everything looks great and romantic.” This is a perfect example of relying on Mother Nature — not filters — for gorgeous photography. Wedding days are crazy-busy and photographers do their best to get every shot you’d like in the bank. But day-after shoots can help them hit all their marks, and are gaining popularity with conscientious couples. “Day-after shoots are also a great idea if you want to shoot in a location that’s different from your wedding venue or if time is a factor and lighting becomes an issue,” Gurkin says. Family portraits tend to be some of the more unnatural shots in a bridal album. Seriously — when do you ever stand in a straight line, with perfect posture, all looking in the same direction, in real life? “Casual family photos are a great new trend because they bring out more relaxed emotions, which can ease tension during family portraits,” says Barlow. “They usually take place during emotionally charged times, either right before or right after a wedding ceremony, so anything that keeps the stress level down will usually result in better photos.” Your photographer should try unique locations, or catch people hugging and chatting — being a family instead of moonlighting as models. A more formal shot that’s still relaxed? Have everyone join arms in a casual group hug. Whether you have your photographer take aerial shots of just you two or everyone at your wedding, this is an effective way to capture the spirit of the day. “I’m all about interesting angles, so if there’s an overhead vantage point — especially of the reception tables — I love taking this shot,” Gurkin says. Some social-media-savvy couples are setting up “selfie stations” for their friends and family (a pretty backdrop to shoot themselves having a great time at your wedding). “As a photographer seeking out authentic moments to document, guest selfies can add to a fun and spontaneous atmosphere at any wedding,” Gurkin says. Of course your nuptials will be romantic for you and your partner no matter what, a stolen moment alone after dinner, your time with the photographer, and of course that whole ‘getting married’ part! But how do you take your guests along for the ride, and let them feel as wrapped up in your wedding as you? 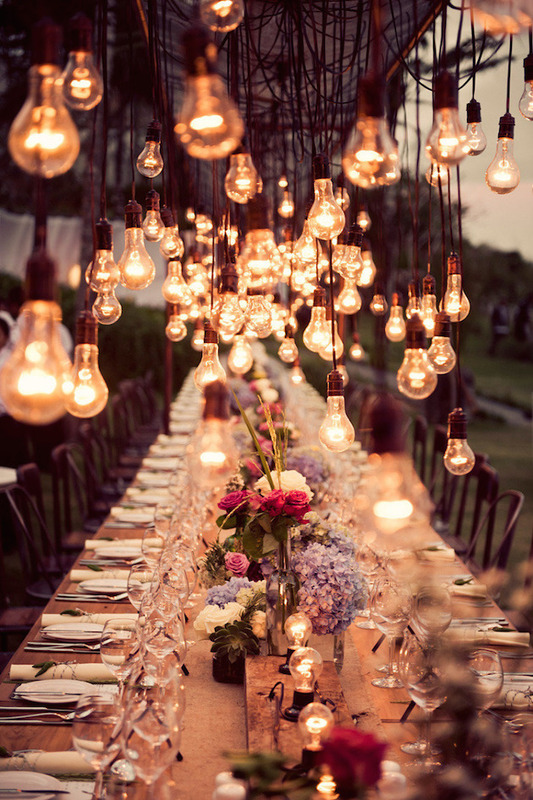 Lighting is perhaps the one element that can transform the feel of your wedding instantly. 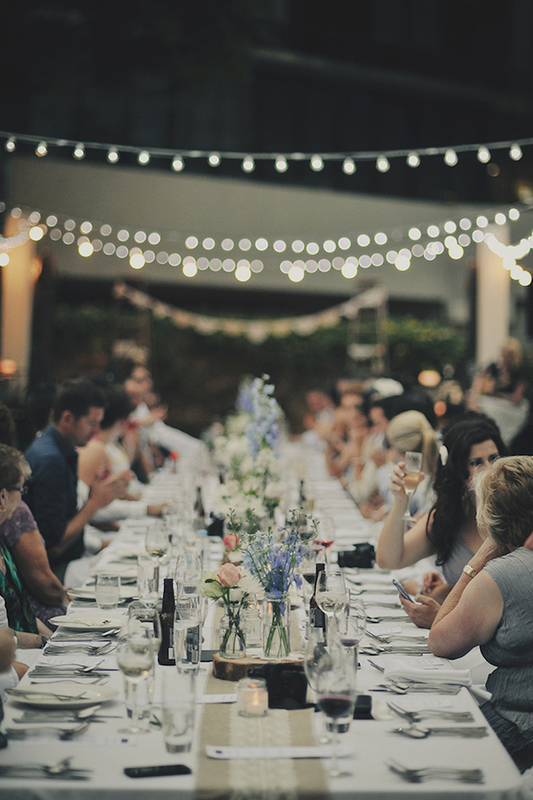 Whether you have a budget for lighting production, you speak to your venue about what they can offer or you simply reuse your fairy lights from Christmas, carefully considering how to best light your space, will work wonders on romancing your guests. Your wedding ceremony sets the tone for the rest of the day, and is one of the parts where you can really guide the atmosphere. 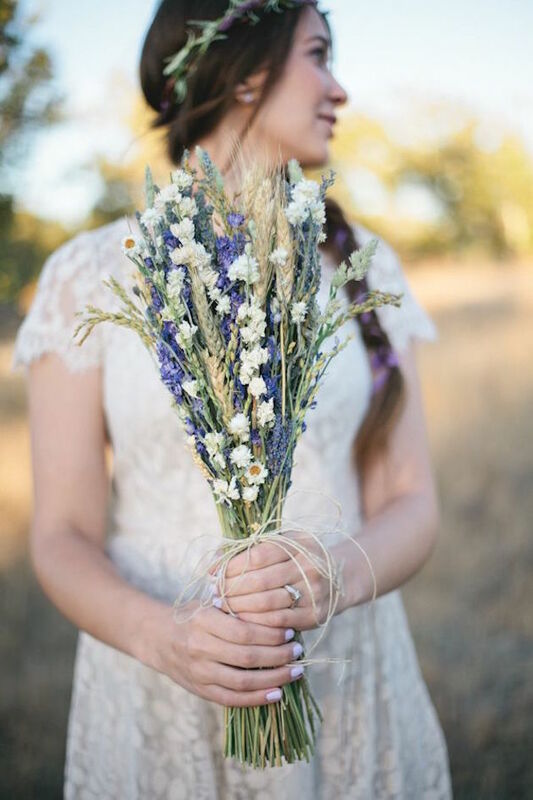 Opting for really romantic ceremony readings, personal vows, and unique ideas like a family blessing of the rings, a hand-tying ceremony, planting a tree or lighting a unity candle, all add to the loving vibes. And get your guests involved from the start. Scentscaping (yes, it’s a thing!) is a huge buzzword in luxury weddings, but can also be adapted on a budget for any big day. Smell is perhaps the most powerful sense for evoking emotion, but it’s often overlooked for weddings (understandably) in favour of food, music, and the look of the day. Companies like Gemma Hopkins’, Design In Scent can create a gorgeous bespoke scent that will become the fragrance backdrop to your day. For a DIY version, think verbena candles, lavender centrepieces or freesia bouquets. 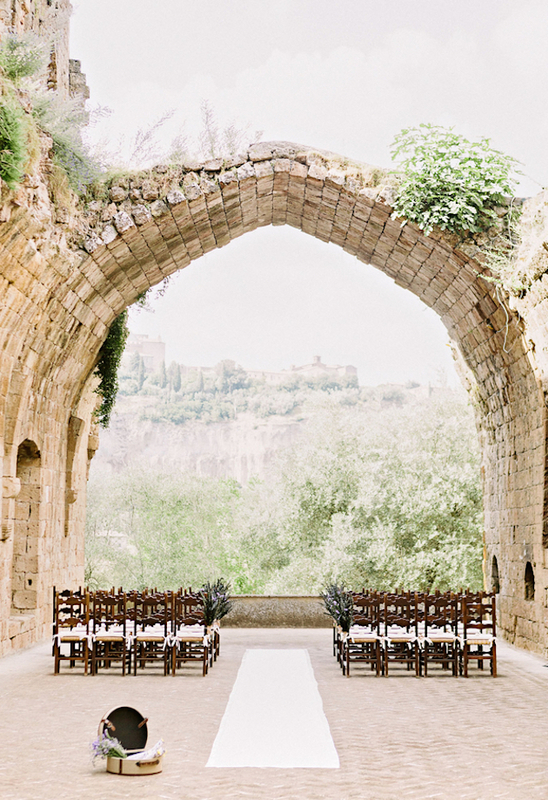 A wedding that smells as good as it looks is steeped in romance! Of course at some point your guests are going to want to hit the dancefloor and Shake It Off to Taylor Swift. 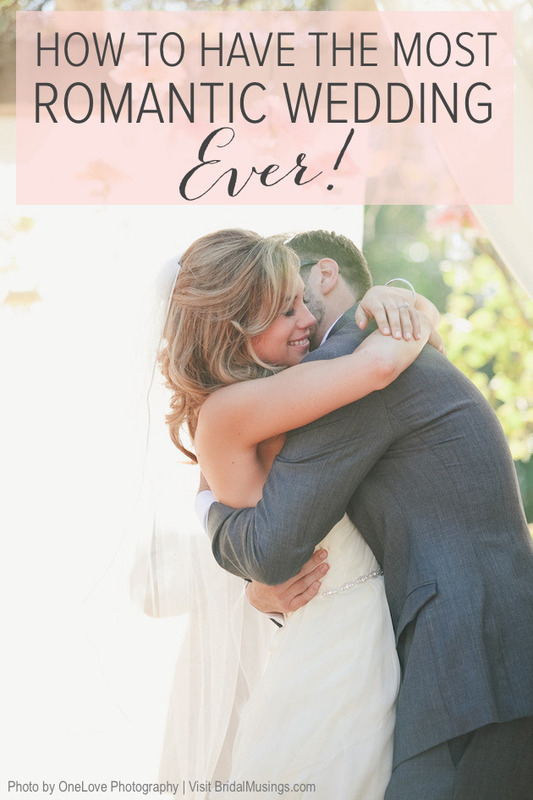 But before that, your wedding music can go a long way to setting the feel for your day. Your choice of food and how you serve it can be a big help in creating a romantic atmosphere at your wedding. We’re not saying you need to woo your guests with oysters and dark chocolate – though I’m sure they wouldn’t mind! Avoid buffets, BBQs, sliders or street food, instead try elegant shared table dishes to get conversation flowing and guests dining in a more intimate fashion. As with the catering, planning your tables to create an intimate, chatty atmosphere will absolutely amp up the romance at your wedding. There’s something really special about long dining tables, that creates a closer, familiar feel over the more formal round variety or top table set-up. Choosing a sweetheart table will also give you and your other have a chance to have your own romantic dinner for two at your wedding. Choose a romantic wedding venue, and all the hard work is done for you! 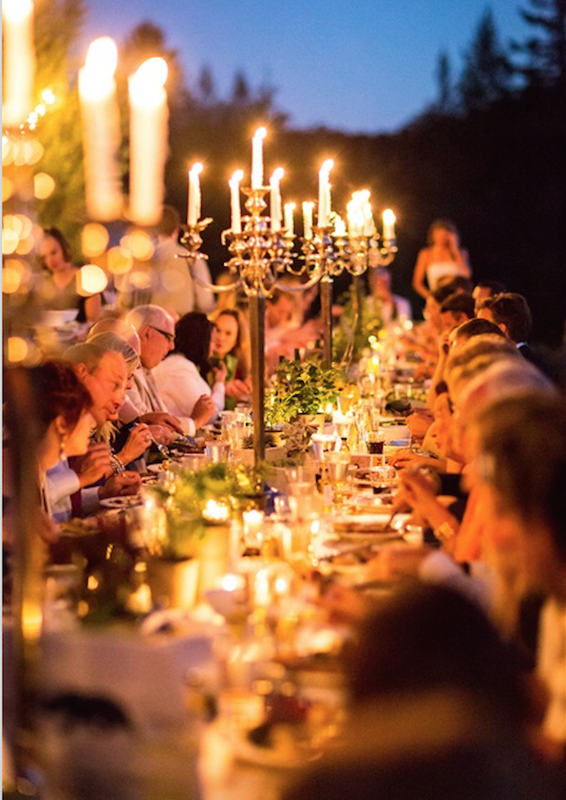 A medieval castle, a beautiful glasshouse, a pretty garden, or an atmospheric old church; take a stunning venue, add some candles (see below) and et voila, you’ve got yourself a seriously romantic setting. Sometimes your guests might feel more like they’re witnessing your romance than feeling it for themselves. But adding an element that’s fun and sweet, will soon get them involved in your day. We love the idea of this balloon march from one venue to the next, (with a release at the end! 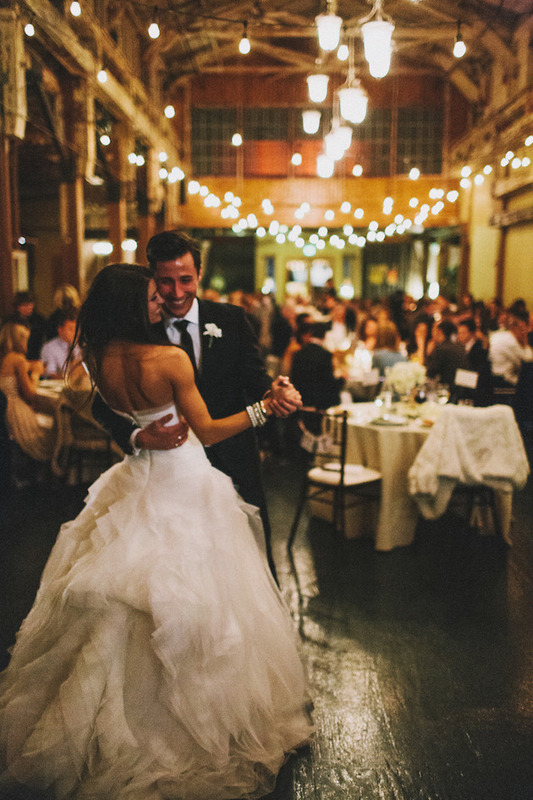 ), you could also have a waltz lesson, an open mic for toasts or some fun games to bring your guests together and feeling the love. Candles work magic in any room, even more so at a wedding. 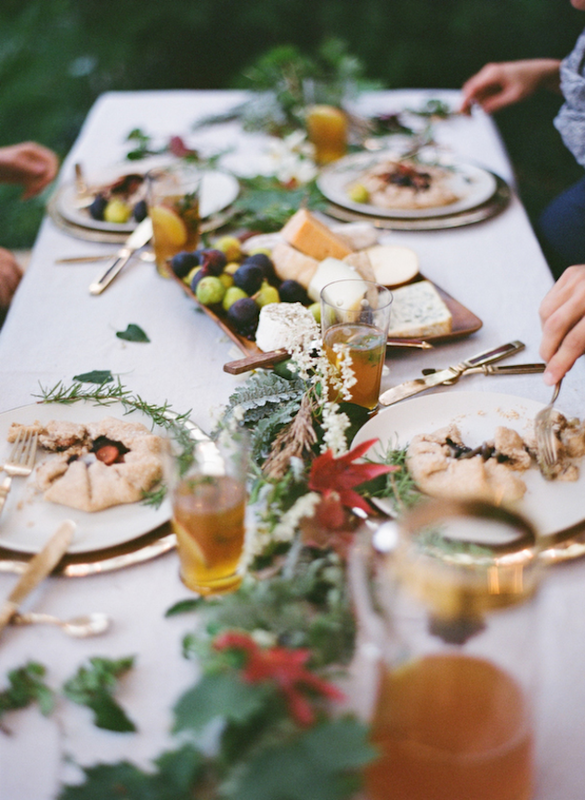 This is perhaps the most affordable way to add instant romance to your soiree. Tealights can add the ambiance, and pillar candles in hurricanes or lanterns will look really stylish, but for full on romance, it has to be tall candelabras for a dramatic, gothic, feel. Did you feel fireworks in your belly when you first met your other half? Why not share that feeling with your guests? 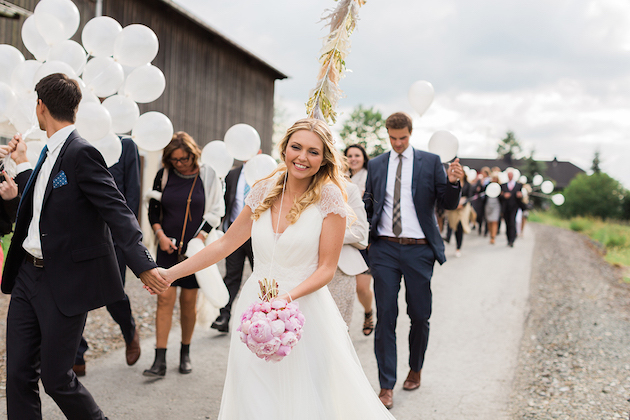 Launching sky lanterns, putting on a fireworks display, or having a sparkler sendoff adds serious sparkle to your wedding and ensures you finish your night on the most romantic note possible. 25 Tips from the people who know best – the photographers. 1. Be Yourself. Don’t try to look or be anything other than yourself. If you are self-conscious about a certain thing and it manifests itself physically, it will ultimately come through in the photography … Be your best self and you can ensure that the photos will indeed portray you as your best self. 2. Relax. Were often our worst critics when it comes to pictures. Remember that you want to be seen the way others see you too. While you want flattering photos, you want to make sure that it still looks like you in the pictures. 3. Laugh! It’s flattering on everyone. 4. Think about the moment. Capturing the romance of the day, the emotion, excitement & intimacy is what it’s all about. Don’t look at your photographer, look at your new spouse and savour it all. Your photographs will be amazing & true. 5. Forget the camera is there and try your best to be playful and warm. 6. Have an engagement session. This is so valuable for client and photographer. The clients have an opportunity to relax and be in front of the camera and the photographer can get to know his or her clients. By the time I am at the wedding we are friends and this makes everyone more relaxed! 7. Practice in the mirror! Study your face and figure out the best smile (or maybe you like your serious face better) and angle for you. 8. Be comfortable. For engagement and portrait shoots, wear clothing that is flattering, but comfortable too! If your 6 inch stilettos are hurting your feet, it will show in your face! 9. Keep makeup and eyelashes normal and classic. 10. Mind the lens. Try to not allow one part of your body to be closer to the lens because it will make that part appear larger than the rest of your body. 11. Get in position. To make your neck look more elongated, drop your shoulders and raise your chin. Imagine that you are being pulled by a string from the top of your head. 12. Be prepared. If you are prone to have flyaway’s or random frizzies in your hair, have a toothbrush with hairspray on standby! One squirt and swoop will tame most frizzies and help your hair look super smooth for pictures. 13. Have white chalk handy. White chalk hides stains on wedding gowns. If you are worried about grass stains, general dirt or in case there is a spill on your wedding day, make sure to have some on hand! It works in a jiffy and no one will know but you! 14. Dab. If you are planning on getting married in the summer and want outdoor photos, oil dabbing strips are a MUST HAVE! Make sure the groom has a hanky too. Sweaty photos are not pretty! 15. Not head on. To look thinner, keep your shoulder to the camera and avoid facing the camera straight on. Hide behind the groom a bit or tuck into his armpit to slim yourself down. 17. Hand on hip. Every girl feels insecure about her bare arms in a strapless dress. The remedy? Instead of the arm laying flat against the torso and making it look wider, simply toss the hand on the hip. It will make the arm much more toned looking. combined with hands on the hips. 19. Natural light is your friend! Getting ready in a room with windows makes for great pictures. Not only is the light beautiful, it is also flattering and makes your skin look amazing. Opening the shades whenever you can will add a lot to the pictures in any situation. 20. Make sure your reception is well-lit. The best wedding receptions seen in magazines have lighting covering the dance floor and on the cakes and table arrangements. Consider hiring a lighting company to light your reception or ask the venue/band/DJ to light your reception for you. The pictures will be amazing and you won’t regret it! 22. Use spotlights. If you are planning a candlelight ceremony, be sure to have a spotlight shining on the area where you will be saying your vows. 23. Prevent the squinty look. If the sun is really bright, close your eyes and ask your photographer to let you know when s/he is going to take the picture. Open them when s/he tells you and that will eliminate the ’squinty’ look. This also works if you typically wear glasses and do not want to wear them for portraits. 24. Love yourself. After photographing hundreds of brides I can tell you that every single bride is beautiful on this day, regardless if they consider themselves plain, overweight etc. The transformation is always astounding. Accept it, believe it and be confident the camera will see it. 25. Be happy. Happiness is beauty! Bridal belts come in many fabric choices such as satin, taffeta and organza to add just the right look to any wedding gown. You can even add a splash of color in your sash and the color of choice this season seems to be blush pink. Beading is very previlent and you will see both pearls stones and bugle beading. Lace applicate adds quite another feeling giving your gown a more tradition even vintage look. Flower belts are perfect for a more laid back romantic look. Do you have an antique broach add that to for a sentimental yet old world style. The wonderful thing about a belt is that it allows you to add your personality to your wedding gown. Enjoy! Here at Occasions, we encourage brides not to spend more than they can afford. We offer these tips for staying within a formalized budget, once it has been determined. Allow some money to any emergencies, expected or not. They will always show up. Keep track of all expenses. If the gown goes over budget $400, you must cut costs elsewhere – $100 less on flowers, food and accessories, $50 less for invitation and party favors. Learn to improvise. If your dream is a band, cut back a couple of hours. If your dream is to have the reception at a luxurious location, have it an hour when hor d’oeuvres rather than a sit-down dinner are sufficient. 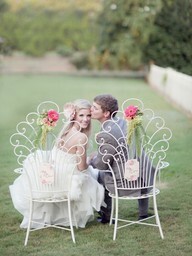 Have an off-season wedding when things are less expensive. Keep it simple. Quiet elegance is always in style. Do come in and let us help you plan a truly memorable event! Remember to book you appointment now to take advantage of our special sales and events.